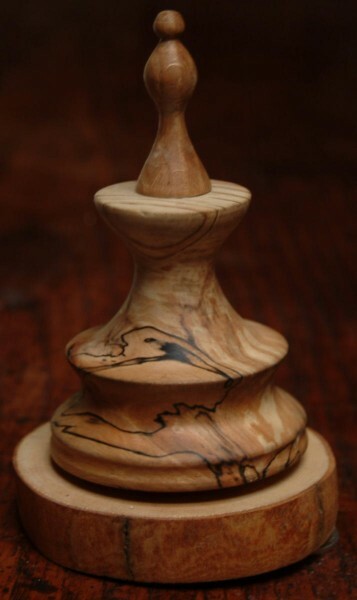 It's a sort of spinning top, made from some pretty spalted wood I found lying around ( johnrw suggested it is probably Sycamore). I had been using it for a couple of years as the wedge that adjusts the jaw of my bodger's bench, not realising how pretty it was inside. I've since turned a couple of other things from the same log and I still have a bit of it left. The base (a slice of Ash branchwood) has a vertical steel spike coming out of it with a sharp polished and oiled point. The top has a steel centre-drilled 'race' glued inside it that rests on the needle. The result is a very low friction bearing that allows it to spin for a couple of minutes. Unfortunately you can't spin it very fast because the position of the bearing well above the centre of mass means it's quite unstable and it tends to wobble badly at high speeds. The surface finish is just beeswax polish, applied and buffed with the lathe turning at high speed. 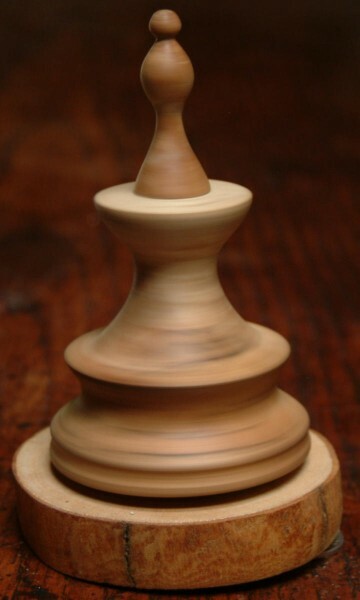 The knob on the top is made from oak IIRC. The first one I made flew out of the lathe chuck while I was polishing it and vanished. I wasted ten minutes searching for it before giving up and making another. I later found the lost one on the floor right behind where I had been standing! (Though actually I think the second one turned out better than the first). I made a tool rest and other wood-turning accessories for my Taig/Peatol lathe and have put together a nice collection of turning chisels/gouges, mostly second hand Ashley Iles tools found on eBay. The lathe is quite small and isn't as rigid as I'd like, but I've managed to make some nice things on it.